Hello hello the slacker is bbbback! Yes it has been a full 2 months since I have posted anything which I do apologize for BUT I have some backlogged tasting sessions hopefully coming up for you depending on time wise so stay tuned. It’s breakfast time and as I’m reaching into the fridge for some eggs I notice the half finished bottle from yesterday’s dinner just chillin there so…as you do….wine and scrambled eggs, the choice of champions. 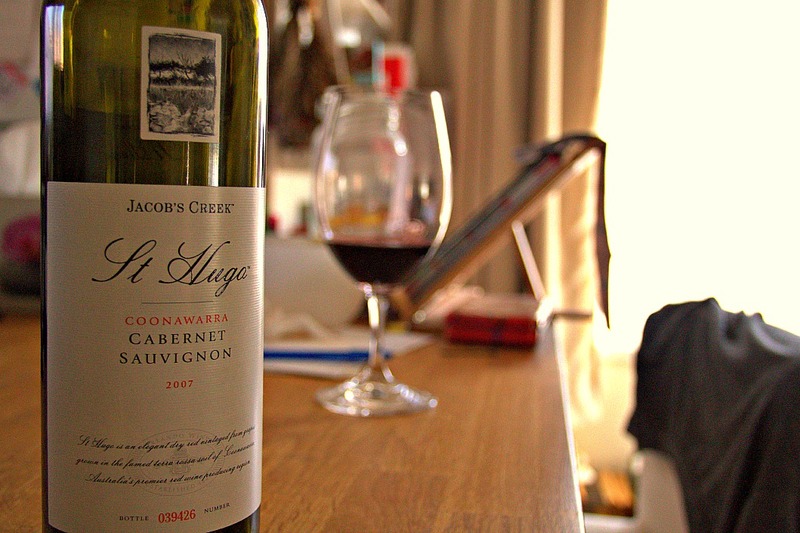 Today it’s le Jacob’s Creek’s St Hugo 2007 Cabernet Sauvgnon, a wine which has some fairly good reputation and named after Hugo Gramp, grandson of Johann Gramp, who is the founder of Jacob’s Creek. Penfolds is probably Australia’s most well known wine label; anybody and everybody will recognise its distinctive bottle. 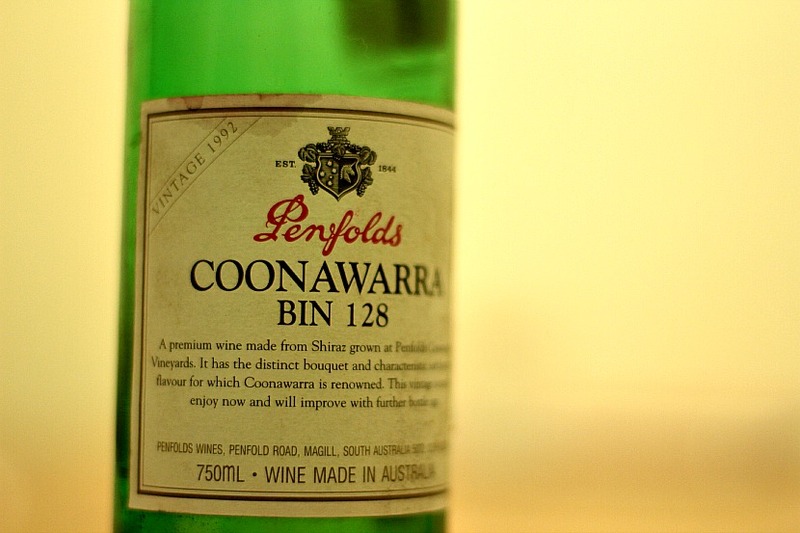 Bin 128 is one of the most distinctive reds in under the Penfolds label but this is a little more old school. O and a big THANK YOU to my new two email followers! Common peeps! The nose was very light with damp earth and leaves in the foreground. There are red fruits coated by vanilla essence in the back. This wine comes off etherial and elegant; very different to what you expect from this label. The acidity limps along on the initial attack and builds up into a sour cherry mid palate backed with tobacco leaves, charcoal, grilled meats, bay leaf and other herbs; all under a light bodied guise. A multilayered wine with a great mix of secondary characters. Finished with light tannins, great bark characters, brings you to the outback with gum nuts and breadcrumbs. I really liked the way this wine evolved and it’s style. The phrase “gentle giant” came to mind; it was an elegant wine, but still punchy and came across with strong flavours. It has a good structure at this age, nicely layered and quite complex. Ken’s thumbs up, though having said that, it has probably juuusssst past its peak so time to venture into your cellars people, I wouldn’t wait much longer to drink this. Me thinks have it with crispy skin duck. It’s Kenny here bring you your weekly hit of wine crazy. 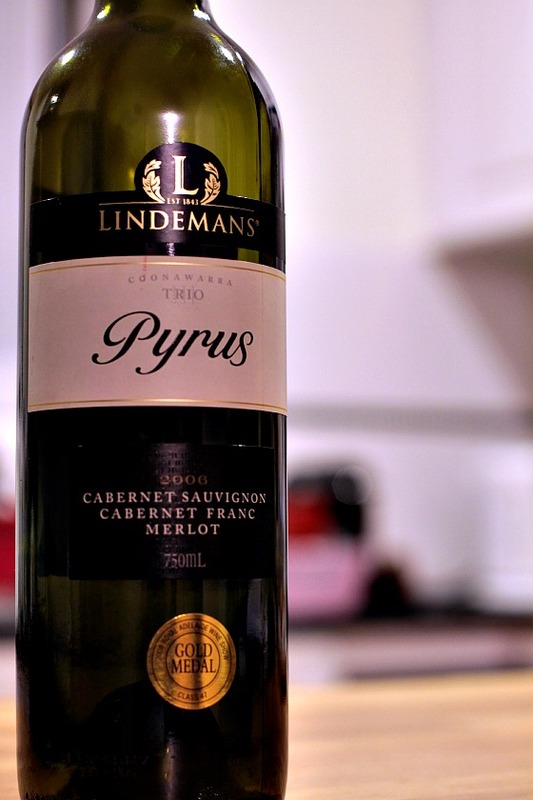 Today I get to introduce you all to the Linderman’s Pryus Coonawarra Trio. It’s Friday! Yay! Was so so tired last week and was tempted not to write this but thought of my 10 followers (hehe actually, its 11 now! thank you email follower! please comment to let me know who you are!) and said “what the hell”. I have some time after work so I went and looked for a little meeting room and try to take a nap. I ended up chatting the hour away before having to run off to Vue. A bunch of friends booked the mega chef’s table at the new Vue de Monde. We almost had the full 18 but after a miss count, only 17 bums were on the seats. I was really looking forward to this night since I have been to the original Vue on little Collins St before the move and some of those dishes….just wow. A few of the people who shared that night with us were coming again for a repeat experience so expectations were high. We still talk about some of those dishes today! If you have been, you will definitely remember the burnt butter marron, chocolate/coffee smoked kangaroo, cranberry marrow waygu and “the egg”. Magic. Man, have had some rough days at work recently so was looking forward to drinking some great wine. I was schedules to get into some basket press today but alas, that is for another great time. Today we are going to check out the “Balnaves of Coonawarra”. The Tally, flagship of the Balnaves, sits in the Langton’s Outstanding classification and regularly scores highly and sits amongst the company of Australia’s greatest Cabernets. The 2009 Tally was sourced entirely from a single parcel from Dead Morris Vineyard, handpicked for the first time to select only the best bunches and all of the blend received a long maceration on skins for a period of 26 days. Maturation was 16 months in new fine-grained Chateau barriques mostly from Taransaud and some from Seguin Moreau cooperages, before light egg fining and bottling in December 2010, under procork. Initially the nose was extremely closed and tight. The wine in the decanter for almost 4 hours so I was extremely surprised at this. I decided to give it some more time before reviewing. Another hour later…nose is extremely fruity and oaky. There is a red and purple mix berries with yogurt aspect to this wine and there is also an egg custard thing happening. There is some spices of cinnamon and leaves you with a liquorice/sambuca finish. The initial taste on the palate was brown sugar with a sharp orange peel scented creme brulee. It continued this trend peppered with peppery notes throughout. There is a rounded mouthfeel, though light to med bodied with a light tannin structure. The flavours linger in the finish but not very long. There were some creamy yet sour plum aspect here which is pleasant and a general slight bitterness to the wine and coca cola. I am usually not a fan of wines from Coonawarra and this is probably the first one that I kinda liked. It’s a powerful representation of a Cabernet and I can see many new world fans clamoring for this wine. Fairly layered, rich and will develop further and improve with cellaring. Having said that, don’t think the flavour profile agrees with my palate. 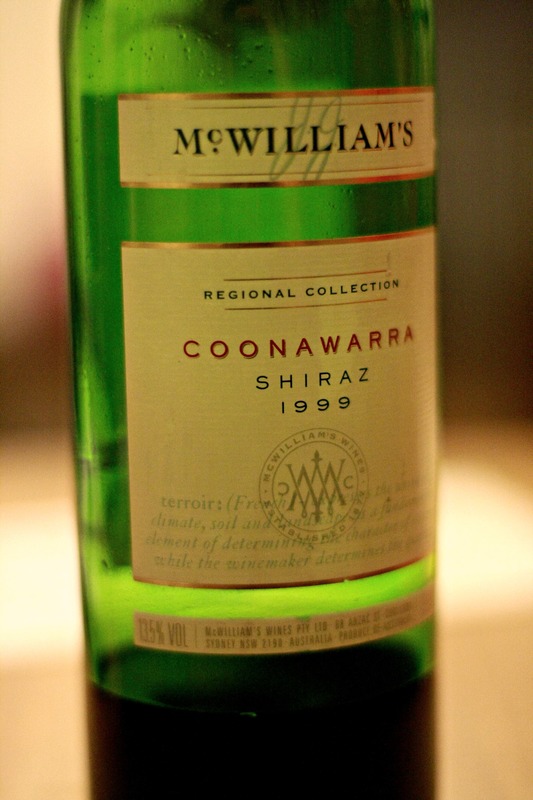 I usually find a chesty bitterness to wines from Coonawarra which I don’t like and this is no different. One more thing I don’t agree with is the price. This wine retails for $80 – $90. Although you do get a better wine, I think you can get similar flavour profiles of slightly lower quality at half the price. If this wine was at the $50 mark, I would consider it. All in all, a good solid wine, one for the new world fans and if you have had this before, please post and let me hear your thoughts! 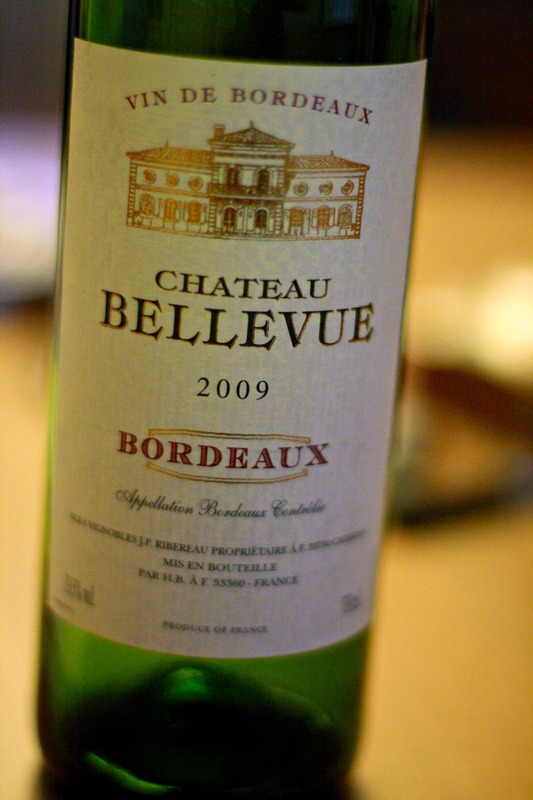 Continuing the French theme, we got some more Bordeaux today. Presenting…. Nat’s parents got this as a present today so lucky us. Retails for around $10, and screw top on a french bottle! Wow, times are changing. Looking at the label, it’s within the same category of wines as I have been drinking recently; the Cheval Noir and the Chateau Haut-Madrac. Randomly going on a running theme here shall we say. This guy is again a Merlot dominate wine with Cabernet Sauvignon blend and at 13.5% alc./vol. Passed once through an aerator. Shall we taste? Nose is pretty deep with black fruits, blackberries. A big lush nose with some oak, almost Barossa in style. The attack is lean, medium bodied with a nice mix of acidity and fruit. Lacks structure until it hits the mid palate where the tannins come in to balance out the acid and bring something to the mouthfeel. Finish is dry on the gums and very long with some lime characteristics and a bit salty. Tastes haps better after more and more time in the glass, less oak and more smooth and fruit. Not much happening here but a nice tasting wine and reminds me of Penfolds bin 28. Initially I thought this was going to be crap but all things considered, I’m kinda impressed given the label. Don’t judge a book by its cover hey? Not a great wine but getter than most standard casual wines, and better than the CHeval Noir and Haut Madrac at a better price point. I would guess that this would be a $20-$25 dollar wine so it’s not without merit. Mid writing this review, I had to drop some things off at parents house. My brother and his girlfriend was there and started shouting “Ken’s here! Another reason to open a bottle!” At 11.00pm I thought? You cannot be serious?! Apparently, Pol (brothers girlfriend) came back from her work Christmas function where that had unlimited drinks! (just the nonalcoholic kind…yeah…). My dad scrummaged around so I can’t let my family do all the heavy lifting, if I must I must. So if your still reading, we get a special guest of wine number 2. Got a bit of ages to it too! 13.5% just like the previous. We aerated this into a decanter for about 15 mins? No justice but it was getting late sooo….Lets get right into it! The nose brought me straight into middle earth (or New Zealand) with green and lush rolling hills. French oak is present with dried cranberries. Some initial sharp sourness made me gasp…hope its not vinegar! Attack is weird. It’s watery, background of tannin, well integrated fruit and acid. Balanced but feels unbalanced. Mid palate is cranberries and no increase or decrease in intensity of flavours from the initial attack. Some burnt wood and pineapple, the bits you get towards the skin. Finish is smooth light tannins, oak comes out to party here with vanilla notes. It’s a long long, very long finish with some apricot flavours you get at the seed, persimmon and leaves you with a very waxy mouth. This feels like a matured wine, mellow and just chilling out. It has some complexity to it, solid mix of richness, smoothness and fruit flavours but does feel like it’s past its prime and wasn’t intended to taste this way. Bottle notes say its full bodied, cherry, spicy, plum and clove (which you get from the numb wax mouth). The fruit has faded into shadows and the supposed find grained tannins and spicy oak is a ghost. Not a bad effort, but again, nothing to write home about.